Unlike any other sunscreen brands on the market, Hampton Sun offers a wide range of premium sun care products that bring a sense of glamour and luxury to sunbathing. Made up of the finest ingredients, smoothest formulas and most advanced technology, this brand not only provides the highest levels of UVA and UBA protection but also numerous benefits for the health of your skin. With a number of celebrity advocates, including Kim Kardashian West and Kylie Jenner, you can be assured that Hampton Sun products are of the highest quality. Renowned for luxurious formulas, Hampton Sun only uses the purest of ingredients with the most developed and current sun care technology. With the assistance of internationally recognized chemists, this exceptional brand is able to offer you optimum protection. Hampton Sun’s formulas include a variety of physical ingredients that reflect the sun’s rays, but also chemicals that absorb them before they can cause any major damage to your skin. Unlike most other sunscreen brands Hampton Sun includes polycrylene, a FDA-approved ingredient that will absorb UVA rays and boost your skin’s water resistance. As well as providing you with exceptional protection, Hampton Sun’s products are also kind to your skin with a mixture of vitamins, anti-oxidants and natural compounds. Formulated with natural ingredients like aloe vera, almond oil and cucumber extract, this range will help to strengthen the protective barrier of your skin, preventing any signs of ageing. 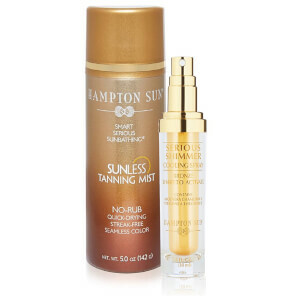 Use the Hampton Sun SPF 30 Tanning Lotion to protect your skin from the sun’s harmful rays. With both both UVA and UVB protection, this product will provide your skin with maximum protection. Formulated with numerous vitamins and anti-oxidants, this moisture-rich product not only shields your skin from the sun, but also strengthens and repairs it. Just one use of this lotion will leave your skin feeling soft and smooth. In order to retain a glamorous glow, you must hydrate your skin to avoid the risk of peeling. The Hampton Sun SPF 15 Hydrating Face Cream is ideal to keep your face nourished. Enriched with a blend of natural and organic ingredients, this luxurious moisturizer will diminish any fine lines and reduce any redness.